A solicitor jailed for murdering her two baby sons has been cleared by the Court of Appeal. Three judges decided that Sally Clark's conviction was "unsafe". She was convicted of smothering 11-week-old Christopher in December 1996 and shaking eight-week-old Harry to death in January 1998 at the luxury home she shared with her husband Stephen. A composed Mrs Clark emerged from the cells at 1540 GMT to be hugged and kissed by her husband. Mrs Clark said: "Today is not a victory. We are not victorious. There are no winners here. "We have all lost out. We simply feel relief that our nightmare is finally at an end. "I would like to thank the hundreds of people who have written to offer me their support. "These letters have been my lifeline - a source of great comfort especially during my bleak times and I've read and re-read every single one. "Be in no doubt, it was a tough experience to be in prison. "The support that I received while I was in there has made it much more bearable." The court had been told that new medical evidence that suggested Harry Clark may have been suffering from a brain infection was withheld from her defence team. The judges, Lord Justice Kay, Mr Justice Holland and Mrs Justice Hallett, told the court: "We are satisfied that the trial of this appeal was not a fair trial in that the jury were deprived of the opportunity of hearing and considering medical evidence that may have influenced their decision." The General Medical Council (GMC) said it was considering whether to take action against two pathologists whose evidence helped convict Mrs Clark. Dr Alan Williams initially said Harry had died from being shaken - and then changed his finding to smothering during the trial. Michael Green, professor of forensic pathology at Sheffield University, who has since retired, also changed his opinion about the cause of death. A GMC spokeswoman said: "We are aware of the doctors and are considering whether action, if any, needs to be taken." 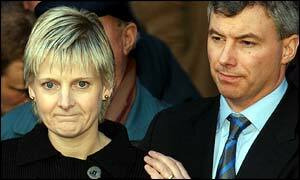 Mrs Clark burst into tears as the verdict was announced and later mouthed "I love you" to her husband. Frank Lockyer, Mrs Clark's father, said his feeling was one of "total admiration" for his daughter and son-in-law and for the way they had coped over the last five years. He added: "It's very easy to be proud of one's daughter when they are taking A-levels and university degrees. "But the real time to be proud is how they react when the chips are down." Earlier, the Crown had indicated that if Mrs Clark won her appeal they would not be seeking a retrial. Clare Montgomery QC, for Mrs Clark, said that new evidence emerged in 2000 that there was a staphylococcus aureus infection which had spread as far as Harry's cerebral spinal fluid. She said the prosecution pathologist Dr Alan Williams, who had carried out post mortems on both babies, had known about this evidence since February 1998. Microbiological test results demonstrated Harry probably died suddenly in reaction to the bacteria, she added. Lord Justice Kay also criticised Dr Williams, saying the medical evidence was not disclosed because of his "failure... to share with other doctors investigating the cause of death information that a competent pathologist ought to have appreciated needed to be assessed before any conclusion was reached. "The Court of Appeal on the previous occasion reached their conclusions wholly unaware of this aspect of the matter." He added: "We have no doubt that the resulting convictions are, therefore, unsafe and must be quashed."